Ai Chi movements can be used to improve movement efficiency of clients who have chronic pain, arthritis, fibromyalgia, chronic obstructive pulmonary disease, balance deficits, diabetes, multiple sclerosis, or other neurological and orthopedic problems. Non-weight-bearing activities such as swimming have well-known benefits on maternal fitness. The aquatic environment can help to mitigate some of the potential fitness loss in injured athletes. Aquatic Exercise for Rehabilitation and Training shows professionals how to design aquatic rehabilitation and exercise programs for various groups and individuals across the life span. Prescribing the right aquatic exercise program for those with functional limitations is challenging, in part because the literature on water exercise is limited. That prescription is made all the more difficult when working with clients and patients with a wide range of limitations. Aquatic Exercise for Rehabilitation and Training shows professionals how to design aquatic rehabilitation and exercise programs for various groups and individuals across the life span. The authors guide readers in choosing the right exercises for their clients—including the appropriate exercise frequency, intensity, and duration—based on each client’s abilities and limitations. Aquatic Exercise for Rehabilitation and Training is liberally illustrated and comes with a DVD that demonstrates nearly half of the book’s exercises and highlights key points for each. The DVD also contains printable evaluation sheets that will help you identify your clients’ needs, evaluate specific therapies based on those needs, and choose the best therapies for your clients. Using case studies as examples, Aquatic Exercise for Rehabilitation and Training presents current concepts, explains how to apply them, and assists readers in determining optimal intervention plans for each client. 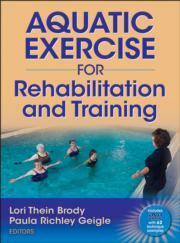 The text covers the gamut of aquatic exercise for rehabilitation and training, addressing all populations and ages. The authors provide information for adapting programs for various clientele: injured athletes, older adults, and people with special exercise needs, such as patients with cerebral palsy, brain injury and stroke, multiple sclerosis, and rheumatoid arthritis. Use Aquatic Exercise for Rehabilitation and Training with confidence as you design exercise programs for your clients. Learn how to assess your clients’ needs, provide specialized training for various populations, and prescribe neuromuscular training, core musculoskeletal training, and upper- and lower-quarter musculoskeletal training. This book and DVD is a valuable resource, no matter who your clients are, as you help them rehabilitate and train in water. Reference for physical therapists, physical therapy assistants, occupational therapists, and athletic trainers. Also a reference for specialists in aquatics, fitness, and general rehabilitation. Lori Thein Brody, PT, PhD, SCS, ATC, is a senior physical therapist in Madison, Wisconsin. Her aquatic therapy experience includes nearly 20 years of treating a variety of patients. Brody is a frequent contributor to the body of knowledge in rehabilitation, including a popular text on therapeutic exercise, teaching continuing education courses, and providing postprofessional coursework. Brody received the Ron Peyton Award in 2006 for sports physical therapy. In her leisure time, she enjoys swimming, running, biking, and snowshoeing. Paula Richley Geigle, PT, PhD, is an assistant professor in the department of physical therapy and rehabilitation science at the University of Maryland School of Medicine. Geigle's 27 years of clinical practice as a generalist includes aquatic intervention. Part of her research agenda focuses on incorporating aquatic exercise to manage the negative health outcomes of cancer and aging. Geigle is past president of the Aquatic Physical Therapy Section of the American Physical Therapy Association (APTA) and served as coeditor of the Journal of Aquatic Physical Therapy. She received the Outstanding Research Award in 2006 from the Aquatic Physical Therapy Section of the APTA. In her spare time she plays tennis, hikes with her golden retrievers, and reads.